Additionally, when you have an air compressor to handle what would otherwise be physically grueling tasks, it spares your body any stress, soreness or fatigue that could otherwise accumulate when manually performing all the pressing, striking and scrubbing movements. Most importantly, the use of an air compressor with suitable tools will give your work the professional finish it needs to be aesthetically pleasing and fully functional for years to come. In everything from metal and woodwork to crafts and automotive repairs, people are switching from both manual and electrically powered tools to embrace the more efficient, less strenuous, and environmentally friendly option of pneumatic tools. Many people are using them for their own personal hobbies, while others are utilizing them to support their partial or full sources of income. Either way, compressed air allows users to achieve professional-quality work, the likes of which were once only possible when rolled off the assembly lines of factories. Whether you are into car repairs, metal work or cabinet making, a wider range of functions will be at your disposal when you own a high-performance compressor and an arsenal of pneumatic tools. Determine the environment in which you’ll be operating the compressor. Do you plan to use the machine and tools outdoors or inside? Will your workspace be located in a stand-alone workshop or in your garage? Determine the amount of power required to run your operations. Will you be working within reach of power outlets, or running your equipment on batteries or fuel? You’ll need to determine which pneumatic tools are most applicable to your working needs, and then choose an air compressor that best accommodates those tools. Several factors affect which air compressor will fit the job, including if it will have the strength and capacity for the tools, functions or demands in question. Therefore, it’s crucial to know the stats and features that pertain to how a given compressor will perform. The following sections of this article will show you how to make a wise and prudent purchase that will quickly pay itself back in saved time and money. PSI—Each type of pneumatic tool requires its own rating for pounds per square inch (PSI) rating. For example, a spray gun usually needs 50 PSI, while a nailer often requires 90 PSI. Single-stage compressors can normally handle a combined 135 PSI, which will suffice for most garage-scale operations. CFM—When choosing a compressor, the most crucial detail to note is its cubic feet per minute (CFM) rating, because that will determine the number of tools that you’ll be able to operate at one time, as well as the overall power capacity. Each tool that you connect to a compressor will have its own CFM needs, so it’s best to choose a unit with maximum CFM. This will ensure that your compressor properly runs the full array of tools in your arsenal. Tools that demand the highest CFM include grinders, sanders and other pieces of equipment that often run continuously. Tools that are only used intermittently, such as wrenches, tend to require lower CFM ratings. Horsepower—An air compressor’s power measurement is known as its horsepower (HP). In a compressor, this would apply to the motor. Depending on the size or design of a compressor, it could boast anywhere from 1.5 to 500 HP. Compressors with high HP tend to be more flexible and generate higher CFM/HP. SCFM—This stands for “Standard Cubic Feet per Minute,” which means CFM on the extremely rare machines that have nothing but standard conditions. Though this term rarely applies to air compressors anymore, it’s worth knowing about should you ever encounter this acronym. Portable air compressor— As the name implies, these machines are built with portability in mind. No matter where you might need to utilize compressed air, it can easily be done with one of these machines. The operations that typically call for a portable air compressor can applications as diverse as pumping up equipment for ballgames, like basketball, or powering pneumatic tools at construction sites. Stationary air compressor—These larger and heavier machines are meant to stay in one place. Due to their increased capacity, stationary compressors generally provide greater sources of power than their portable counterparts. Stationary compressors provide greater CFM and PSI output. As a safety precaution, a compressor should always be drained after each operation, regardless of the model. This will help prevent the buildup of rust-causing condensation, which could otherwise accrue from moisturized air pressure. As you weigh the advantages of different types of air compressors, you should also determine what you’ll be using as a power source. There are two options when it comes to powering a compressor: gas engines and electrical motors. With gas, you can power up your air compressor in practically any setting, such as on location for building construction projects where electrical sources cannot be accessed. However, when you have a gas engine in tow, it adds to the carrying weight of your arsenal. Certain compressors are designed with special portability features in mind, such as the wheelbarrow- and truck-mounted models, which are often used by teams that need to transport heavy compression tool arsenals to remote work sites. In order to determine the amount of power necessary for your line of work, you’ll need to verify the necessary air flow (CFM) and choose the most appropriate tank size (PSI) — These two measurements decide the efficiency of a compressor in various settings. A surefire way to avoid being underpowered is to choose a compressor that offers at least 1.25 to 2.5 CFM higher than what a given tool requires. As a general safety rule, electrical compressors should be used indoors where conditions are free of moisture or humidity, and gas-powered compressors should only be used outdoors. The primary function of an air compressor is to fill a tank with air. Therefore, the storage capacity of a compressor directly affects the efficiency of a given tool. When full, a compressor with a larger tank won’t have to work as hard to meet CFM requirements, as long as the machine has an even higher CFM threshold. Large tanks are generally the best option for tools that utilize ongoing air, while smaller tanks can adequately handle tools that are used intermittently. Manufacturers of air compressors usually rate the size of a given tank’s storage in terms of gallons. Smaller portable tanks hold a standard size between four and six gallons, which will generally suffice when compressed air is being used for paint guns, nailers and other low-impact tools. At the other end of the spectrum, the larger tanks store air at higher volumes and pressures. Some of the larger stationary tanks store anywhere from 60 to 200 gallons. Whether you need a stationary or portable air compressor, there are plenty of styles from which to choose. In fact, tanks are designed in numerous ways to meet the various requirements of different professional usages. However, the design itself will not impact a given tank’s performance: Designs are generally a matter of application, compressor size, floor space and, in some cases, portability. Pancake compressors—These machines are named after the round, flat bottoms in which a 4–6 gallon tank is housed. 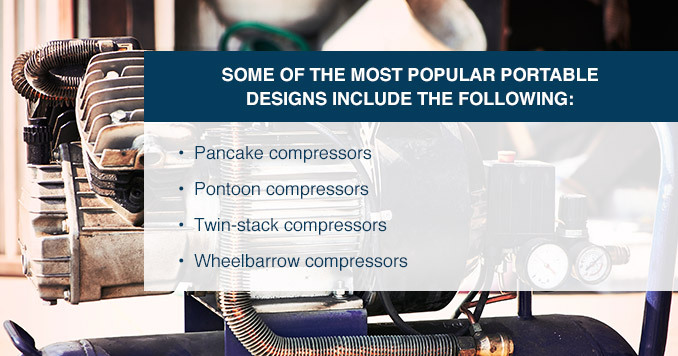 The pancake is one of the most compact portables on the air compressor market. Pontoon compressors— Another portable variant, the Pontoon is distinguished by its long, shaped tank design. A 2–3 gallon tank is stored in this horizontal cylinder. Twin-stack compressors— Features a dual cylindrical design that stores two horizontally placed tanks. The twin-stack allows for greater air power within a compact design that consumes a minimum of space. Wheelbarrow compressors—As the name implies, these machines are built for wheeling around. They feature dual tanks in addition to handles. Air compressors use a pump to harness natural air and compress it within a tank. Compressor pumps come in two types: single and two stage. Most single stage air compressor pumps are capable of 155 PSI, more than fifty points above their typical CFM ratings, which are generally under 100 PSI. With two stage air compressor pumps, the delivery is at least 175 PSI and the CFM ratings are over 100 PSI. While a single-stage pump will compress the air straight to the tank, a two-stage will pump the air twice in each stage before final discharge pressure is reached. The choice between a single- or two-stage pump should be based on the CFM requirements in your line of work. Space—If you reside in a space where storage is at a premium and things are packed tightly, you’ll probably be best served by one of the smaller compressor models on the market. One of the better options in such quarters would be a pancake compressor, which takes up little space while in use, and can easily be tucked away in a closet at the end of a work day.However, there is a limit on the range of tools that will operate on such a small compressor, so it won’t be ideal if you need a machine for high-powered functions like car repair. Of course, for automotive projects, it’s ideal to have a garage or outdoor work area, where you’d have room for a larger compressor with the capacity for a wider range of operations. Oiled or Oil Free—Some compressors need oil lubrication while others don’t. Those in the first category need the lubrication in order for the parts to move. Without oil, the joints would wear down. Lubricated machines usually weigh more than their non-oiled counterparts.Your alternative is the oil-free compressor, which doesn’t need lubrication and is generally a more lightweight and compact machine. Oil-free compressors tend to be more popular with hospitals, laboratories, and clean room operations, who rely on absolutely fluid-free air for critical processes. Air tools have longer life spans than conventional tools. Air tools offer a range of different speeds. Air tools offer torque control. Air tools operate at lower temperatures and don’t produce heat during heavy usage. Unlike electrical tools, air tools don’t generate electrical shocks or pose a fire risk. Air tools don’t release toxins and are environmentally friendly. Air tools generate superior power in proportion to their weight, making them easier to operate than conventional tools. Better for nailing—If your work consists of crafts, construction or carpentry, a nail gun could be the most efficient tool in your toolbox. However, in order to run a nail gun without spending wads of cash, an air compressor is essential. It all comes down to the costs of powering a nail gun. Those that run on batteries range from $200 to $500 in price, while nailers that run on air compression are available for as low as $50.Additionally, pneumatic nail guns offer greater flexibility and are lighter-weight for easier portability. Furthermore, air pressure offers longer lasting power than recharged batteries. Makes painting quicker—When it comes to work like cabinet and furniture painting, an air-powered spray gun will help you complete each task in just a fraction of the time it would otherwise take with brushes or rollers. You can also get a finer, more even finish on woods and other surfaces when you opt for a spray gun over more traditional painting utensils. Whether you do this to make items to sell or just as a personal hobby, an air-powered painter will make each furnishing look like brand new; for only a fraction of what it would cost to go out and replace each item one by one. DIY car repairs—Wouldn’t it be great if you didn’t have to worry about the potentially high costs of car repair? If every time something went awry with the mechanisms of your vehicle, you could simply maintain it yourself? In fact, many of the smaller repairs that vehicles often need—such as tune-ups, filter changes and PCV valve replacement—are relatively easy to master by following some of the simple instruction guides that can be read for free on the Internet.The hard part is getting out the bolts in hard-to-reach areas where parts are often rusty — in cases like these, socket sets simply won’t do the trick. However, the same task can usually be accomplished in seconds with the aid of an air-powered ratchet tool. Efficiency and flexibility – Tools that run on compressed air offer efficiency in terms of time and cost that simply can’t be beat by standard tools.Air compressors are also incredibly flexible in the range of tools supported, and the amount of tasks that can be accomplished. For instance, if you do a lot of wood cutting, a pneumatic blowing tool will clean up all the sawdust in a snap. If you need to add new cabinets or shelves for added storage space in your house or condo, an air-powered nailer will help you mount them into place in no time. If it’s time to pass your growing daughter’s tricycle down to your toddler son, a paint-spray tool will make it easy to change the color from pink to baby blue. Ultimately, air tools outlast and outperform their battery-run and cord-operated counterparts because there are fewer parts to move around and everything is powered from a single motor. What is your purpose for purchasing an air compressor? Would you be using the compressor everyday for hours at a time, or would you only use it for short tasks on occasion? Whatever your pattern might be, the compressor you choose will need to have enough capacity to handle the workload. Where do you intend to place the compressor? If you plan to have the machine outdoors, make sure that it has waterproof features in the areas that count. It’s also important to have a machine with sufficient ventilation for air-cooling purposes. What amount of pressure will your projects require? The demands of your tool will determine the capacity at which your compressor will need to operate. Determine which of the tools in your arsenal will require the highest volume of air, and choose a compressor with PSI that exceeds that level. The demands of your most intensive tools will also be a determining factor for whether you’ll need a single stage air compressor or a two stage air compressor. What will be your required air flow? While CFM is the measurement of air creation within a compressor, the amount of air that you can harness is really measured in Actual Cubic Feet per Minute (ACFM). Before you decide upon a particular compressor, check to see whether its CFM is an accurate mirror of its ACFM. How much horsepower do your tools need? The horsepower level of a given compressor will ultimately determine how much air will be generated, and it runs in relation to the CFM rating. Beware of machines that have high horsepower but generate low levels of air flow, because these compressors tend to be short-lived unless limited to occasional use. They aren’t the right machines for professional use. What would be your ideal air tank size? Whatever your air demands might be, you’ll need an air tank that’s large enough to produce the levels required for your operations. You’ll also want to consider how much space you have for an air tank — the difference between a vertical or horizontal tank could be a deciding factor: A vertical requires less room, but tanks of that design do not exceed 10 HP. A cast-iron body will make the machine more durable in harsh conditions like rain and snow. Stainless steel valves can help prevent corrosion. An oil guage ensures you don’t accidently let the oil run out. What is the maximum electrical allowance at your base of operation? It’s crucial to check how much voltage will be at your disposal. In most residential households, 110 volts is the standard. But this will only support a machine of 3 HP at the very most. You must determine your voltage in relation to a compressor’s horsepower before you commit to a purchase. Consult with an electrician prior to making a purchase to be sure you select the correct size. What type of control system would work best for you? When it comes to air compressors, control systems are designed in three variants. One is the start/stop system, which is best for projects that only need intermittent air. Start/stop is also ideal for machines that start fewer than six times per hour. The second option is constant speed control, which is best for machines that start more than eight times per hour because it’s designed to prevent over-persistent starts and stops. Lastly, there’s the option of dual control, which allows you to set the auxiliary to either start/stop or constant speed mode. What other things should you consider? When you purchase an air compressor, there are things that you’ll need to tend to from time to time in order to keep the machine in working condition. No matter what make or model of compressor you ultimately choose, the type of oil that you use will be integral to the machine’s lifespan. Another item to watch out for is moisture buildup, which can lead to corrosion of your compressor. Therefore, moisture drains and filters are important add-ons that can help you prevent condensation. Thermal Protection—If an overload occurs, this will cut the motor to prevent damage to the machine. Exhaust adjustment— Exhaust can be a problem, especially in insulated work environments. This adjustment funnels the exhaust in the opposite direction of your projects. Multiple couplers—If you operate a variety of tools from your compressor, couplers will let you keep them attached simultaneously and switch from one to the other based on your current application. Some compressors even come with additional tools and gadgets, such as sprayers, nailers and hoses, any of which could add more bang for your buck. Angle disc grinders— One of the most popular tools among builders and metalsmiths, pneumatic grinders are often utilized to remove extraneous material from a construction piece. Depending on the task, a grinder might be equipped with sanding discs, buffing pads, brush wheels, blades or grinding discs. 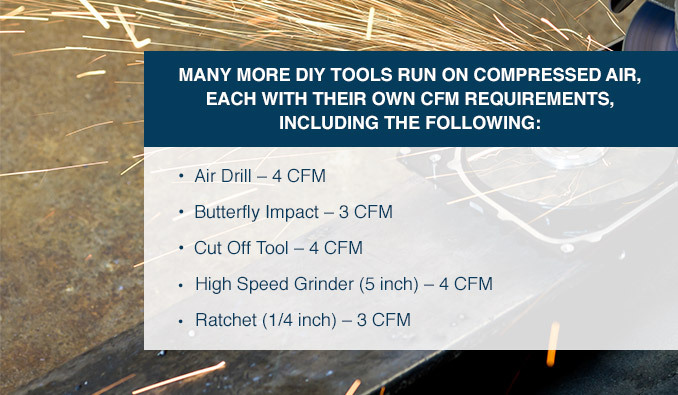 Air-powered angle grinders generally require 6 CFM. Die grinder— A rotary tool that’s used on wood, plastic and especially metal in order to sand, polish and grind rough edges and surfaces. Among sculptures, welders and millwrights, the die grinder serves as a handy engraving and contouring tool. Pneumatically driven die grinders usually require 8 CFM. Random orbit sander—This power sander utilizes a randomly orbiting blade, which means that it spins in multiple directions. The tool is preferred over orbital sanders by craftspeople and furniture makers because it provides a smoother finish with no swirl marks. The secret is the tool’s non-constant motion, which never retreads the same path on a surface. This sander typically requires 6 CFM. Grease gun—A tool used in workshops for the precise application of lubricants on machine parts. Pneumatic grease guns force the grease—usually of a thick consistency— through the aperture with compressed air onto machine joints and other parts that need lubrication in order to stay in functioning condition. Grease guns generally require 4 CFM. Nailer— Pneumatic nail guns are a popular household tool for a variety of projects, from shelf and cabinet making to renovation and fence construction. The hammering impact is generated from compressed air, which is drawn in at the upstroke and pushed out at the downstroke. Nailers set boards into place in a fraction of the time that would otherwise be taken up by manual hammering, all while sparing users undue physical strain. Nail guns generally require 1 CFM. Impact wrench—An air-powered socket tool that’s often used by DIY mechanics in auto repair work, the pneumatic impact wrench has eclipsed its electric counterpart. The tool is also used in building construction, machine maintenance, product assembly and various other heavy-duty applications. CFM requirements for the impact wrench vary by size, but are generally rated at 5 for the 1/2 inch and 7 for the 3/4 inch. Air hammer—A pneumatic tool that craftspeople use to break up objects and carve materials into form. The air hammer can accommodate a variety of tools, such as joint separators, exhaust pipe cutters, shock absorbers, rubber bushing splitters and tie-rods. With its ability to stretch, shrink and smooth a vast range of metals, the air hammer is used on everything from thin aluminum to 10-gauge steel and generally requires 4 CFM. Sand blaster— This tool is often used by builders and mechanics to peel away corrosive deposits such as rust, grease and old paint. The three-gallon sand blaster will generally require 4 CFM. When it comes to producing top-quality crafts, furniture and metal work, a professional-quality pneumatic arsenal is essential. Thankfully, such an arsenal can now be built within a home or garage at only a fraction of the cost, size and weight of the equipment setups found in factories. The most efficient and compact air compressors on the market for the types of tools and projects covered in this article are offered by Quincy Compressor. Q12126VPQ – vertical, 26 gallon, 165 lbs. Both compressors share the following stats: 115V, 2HP, 7.1 ACFM, 135 PSI. Also featured in the Single Stage series is the Q13160VQ stationary single-phase vertical compressor, which boasts the following stats: 230V, 3.5HP, 12.4 ACFM, 135 PSI, 60 gallon, 261 lbs. Each compressor features a start/stop pressure switch, belt guard, cast iron cylinder and crankshaft, manual tank drain and safety valves. Backed by extended warranties, each factory-tested compressor is built for many years of serious use and like-new performance. For your benefit, we offer extended warranties of two years on packages and three years on pumps when the air compressor and extended warranty kits are purchased at the time. Registration and using the kit’s content are also required to extend the protection. Ready to Buy an Air Compressor for Your DIY Projects? Now that you know the details on air compressors for home and garage-based projects, it’s time to invest wisely in a machine that will power your pneumatic tools for years to come. For more than a century, DIY builders, mechanics and craftspeople from around the world have turned to Quincy for a wide range of air compressors, tools and accessories. Throughout our vast inventory, we have machines to suit operations large and small, from the QR-25 reciprocating air compressor unit, to heavy duty rotary screw air compressor models like those in the rotary screw QGS series. Quincy customers enjoy unique offers and unbeatable deals on the most durable products in the air compressor market. Furthermore, we offer 24/7 customer support through authorized partners, and nearly all of our compressors are backed with some of the strongest warranty plans in the industry. If you’re ready to invest in a long-lasting, high performance air compressor that will reduce hours of work into minutes with only a fraction of the effort, visit our website today and read more about the specific compressor unit that will best serve your needs. Even if you’re still shopping around, we invite you to download our white pages to learn more about our vast range of air compressors.